Developed based on a specific dark pigment, Eclipse® LD² is a shading paint for greenhouses that allows growers to get more stable high shading rates than with other solutions. The product regulates light intensity to provide control to achieve the best possible climate to even the most sensitive crops. Eclipse LD² is highly wear-resistant and can be easily removed with Topclear whenever needed. Some crops like lamb’s lettuce are very sensitive to sunburn and must be protected against excessive light transmission and direct radiation. Eclipse LD² blocks the direct sun light, reducing the temperature and creating a more favorable climate inside the greenhouse. 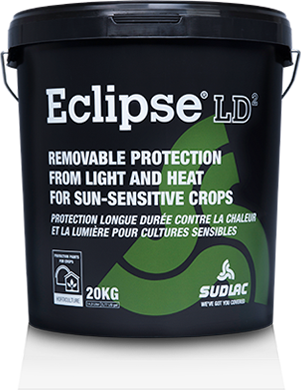 By providing a durable and specific level of 55 to 60% of shading with only 15 buckets in a first layer, and 65 to 70% of shading with a second layer, Eclipse LD² allows to grow these crops under drier soil conditions. This prevents diseases like Thielaviopsis fungus and enhances productivity. Eclipse LD² needs to be diluted with water before spraying it onto the greenhouse. 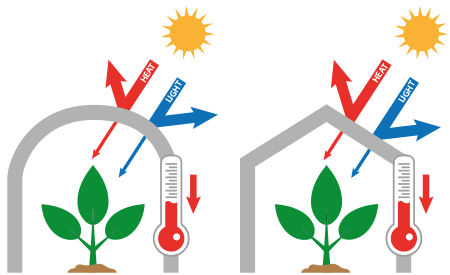 Depending on the application method, type of greenhouse and climate, the dilution rate and amount of total spray liquid can vary to achieve the best result. Eclipse LD² can be applied manually, by machine or by helicopter. Eclipse LD² is compatible with plastic, polycarbonate, and glass greenhouses. Apply a layer of Eclipse LD² in early spring + a second layer of Eclipse LD² if needed before the hot season (or Eclipse LD depending the result expected). Eclipse LD² is removable with Topclear at every desired moment. Apply Topclear in the advised amount and dilution maximum 3 days before rainfall. Read the complete instructions on how to use Topclear. Please consult us for helicopter application. Not sure Eclipse LD² is right for you? Eclipse LD² paint limits black root rot problems.